Ukrainian boxer Oleksandr Usyk (15-0, 11 Kos) wrote history tonight at the Olympic Stadium in Moscow as he unified all four major world titles in his division and became the winner of the first season of the World Boxing Super Series cruiserweight tournament and thus the first recipient of the Muhammed Ali trophy. He used relentless pressure against heavy-handed Murat Gassiev (26-1, 19 Kos) to smother the dangerous Russian and never gave his opponent a chance to implement his game plan. 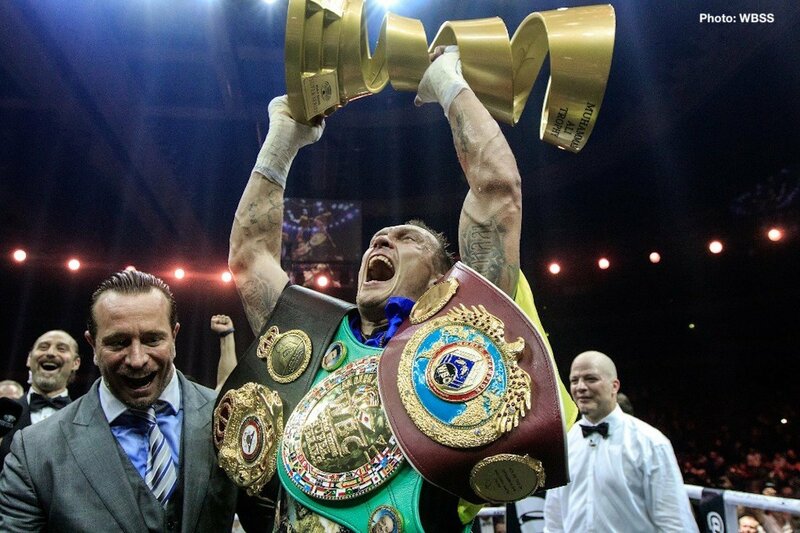 Now that Usyk has accomplished everything there is in his weight class the question is: Where does he go next? In winning this tournament, he has basically cleared out his division. Of course he could defend his title against some of the participants that he didn’t face during the tournament like Cuban knockout artist Yunier Dorticos (22-1, 21 KOs), however the fact that this fighter got eliminated in a tournament that Usyk won would give the Ukrainian a perceived advantage in the eyes of the viewers at home. And I doubt many would tune in if they expect a one-sided beatdown by the current champion. The only fight that could garner some interest would be a rematch with Mairis Briedis (24-1, 19 KOs), but that’s only because Usyk struggled against him in their semifinal bout. And because that was a tremendous fight. Another possibility is that Usyk faces one of the emerging new contenders like Frenchman Arsen Goulamirian (23-0, 15 KOs), who captured the regular version of the WBA cruiserweight strap, or the recently un-retired Beibut Shumenov (18-2, 12 KOs), however I doubt one of those fights would get many people to turn their heads, especially in the UK or US. A move to heavyweight has also been considered by the cruiserweight king, he even expressed interest in a clash with British heavyweight superstar Anthony Joshua (21-0, 20 KOs). While it is not uncommon for accomplished cruiserweights to move up in weight and seek new challenges (David Haye comes to mind) this strategy may be not without risk for Usyk. His style of boxing relies primarily on constant movement, seemingly never-ending stamina and an incessant assault with the jab. The question is, how will those additional pounds that Usyk will carry around affect his way of fighting. It should also be noted that he is a fighter who preferably fights from a distance. Now Usyk is 6’2” with a 78” reach. In comparison to that Anthony Joshua is 6’6” with a 4-inch reach advantage. Deontay Wilder is even 6’7” with a reach of 83”. In my opinion it will be quite difficult for Usyk to implement his style of fighting against opponents who tower over him. Usyk himself may have chosen the best of both worlds when he challenged former cruiserweight now turned heavyweight Tony Bellew (30-2, 20 KOs). Now if Tony Bellew is good at one thing that is promoting a fight. I mean just look at his rivalry with David Haye. If such a fight were to take place it would surely happen in the UK. I doubt that Usyk has a problem with traveling to the backyard of his opponents as he stepped into enemy territory every time he defended one of his world championship belts so far. In his interview Usyk was open to facing Bellew either at cruiserweight or at heavyweight. In case of the former this would mean that the ukrainian faces arguably the best cruiserweight that was not part of this tournament or previously defeated by him. Bellew even was the WBC champion in that weight class not too long ago. If it’s at heavyweight he would face an opponent of similar size and reach as his previous opponents but in a higher weight class, which would give him a rather safe way to test his abilities without worrying about a potential size, reach or power disadvantage. Whichever path he is going to take from now on, it will only add to an already historical legacy and only will cement his place as one of the greatest cruiserweights of all time.